As a boy visiting relatives in Rock Hill, S.C., during summer trips south, J. Justin Ragsdale was fascinated by an old trunk that belonged to his Uncle Bub, who used to talk about a man called "Massa" who had taken Bub off to war to be a soldier. Every time Ragsdale tried to look inside, his uncle would yell: "Get away from that trunk, boy! That ain't none of your business." Years later, after Uncle Bub died somewhere around the age of 109, Ragsdale, by now grown, went back to South Carolina and searched through the trunk. He found a Confederate uniform jacket and an "iron ball shackle," designed to clamp around a man's neck with a 20-pound weight that hung down to his groin — incentive to keep him from running away. The “iron ball shackle” was designed to go around a man’s neck with a weight that hung down between the man’s legs. 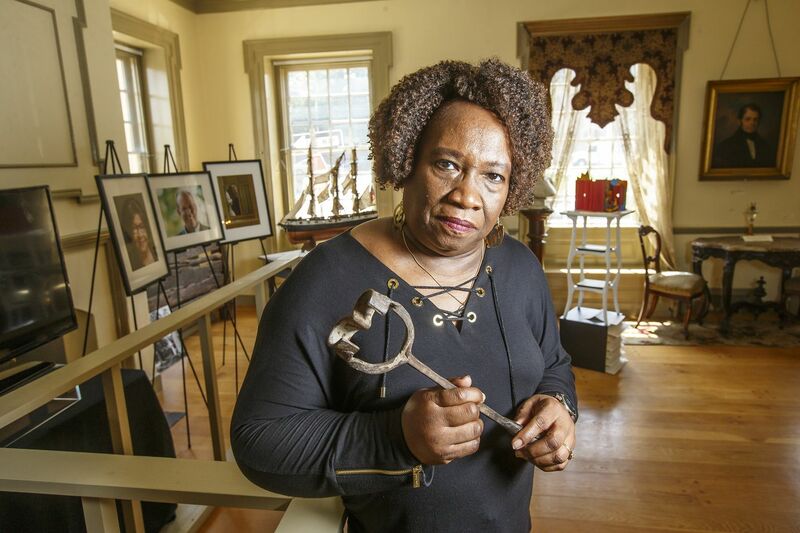 Those discoveries started Ragsdale on a 50-year journey to collect more than 1,800 artifacts about slavery and the Jim Crow era, what eventually became the Lest We Forget Black Holocaust Slavery Museum, operated from a warehouse in the unlikely location of Port Richmond. Now, after 15 years there, a museum that many people have never known existed is seeking a new home. In the meantime, Ragsdale, now 80, and his wife, Gwen, 65, have announced they will temporarily house the museum at the Germantown Historical Society, operated by Historic Germantown, starting in September. "The property taxes went up so high that we just could not hold onto it," Gwen Ragsdale said of the 28,000-square-foot warehouse on Richmond Street between Pacific Street and Castor Avenue, which closed in October. "We had to walk away." But why was a slavery museum in Port Richmond anyway? The River Wards neighborhood with a population that's almost 60 percent white had once been considered a "sundown town," where black people were restricted after sunset, Gwen said. It was her husband's family who first settled in Port Richmond in the 1950s, one of few black families there. Eventually, he operated a construction cleanup company from Port Richmond and bought a former rubber-gasket factory for his business, 3,500 feet of which was eventually used to house his collection. At the time, Gwen was involved in a black history program for her employer, Bell Telephone Co. of Pennsylvania, and brought in the artifacts for an event. When the Ragsdales saw how people were interested, they began showing the items at conventions and expositions, and made the collection an official museum in 2002. Although they didn't keep a visitor count at the museum, they got visitors from all over, "more out-of-towners than locals," Gwen said, because local black people were hesitant to visit a Port Richmond location. Still, the Ragsdales said, the neighborhood supported them. "We never had any problems the whole time we were there," Gwen said. "The neighbors looked out for our building. If they saw something suspicious, they would contact us. It speaks to the relationship we built with the neighborhood." But it was a site unknown to most Philadelphians. Phillip Seitz, a former curator at the Cliveden mansion who wrote the book Slavery in Philadelphia: A History of Resistance, Denial and Wealth, said the Ragsdales have done a "heroic job trying to educate people about the strength and suffering of Africans and African Americans in this country," but have not gotten the recognition or funding they deserved because they are "collectors rather than museum professionals." Nor have they actively sought publicity. As a result, he said, "they don't have philanthropists waiting in the wings to give them the support that more mainstream museums get." The Ragsdales' collection is very important, said Diane D. Turner, curator of the Charles L. Blockson Afro-American Collection at Temple University. "It speaks to the trauma and the disruption that Africans have experienced here," Turner said. "It's important to have a history of the atrocities that American citizens of African descent have experienced over time. "When you see all those chains, it speaks to the African resistance. African people were described as being docile and childlike, but you don't put people in chains and hold them against their will if they're docile." The Ragsdales' collection includes bills of sale for enslaved people and chains and shackles. It includes a Ku Klux Klan uniform a white man brought to them from a traveling exhibit in Lynchburg, Va. — he didn't want his children to know their grandfather was a Klansman. From the Jim Crow era was a box with a drawing of an alligator crawling toward a baby with the text: "Little African Licorice Drops: a dainty morsel." In his talks to school groups and others who visited the museum, Justin describes horrific conditions African people endured aboard the slave slips that brought them to the Americas: how men were shackled to each other and kept in cramped quarters in the bottom of the ship, how they were branded in Africa so their open wounds burned in the seawater. The people were kept in their own waste, and many developed disease and died on board. Before the slaveholders tossed the dead overboard, another person may have been chained to a body for days, watching it being consumed by vermin. Justin doesn't sugarcoat the experiences, even for children. "Blood was paid," Justin said. "Somebody paid in blood for us to be here today. Freedom is not free. That's why I'm working so hard to get tell this story and keep this museum going." Now, the Ragsdales have their sights set on getting a permanent space in Germantown, where they might be a better fit. Down the street from the Germantown Historical Society, there's the Johnson House, a stop along the Underground Railroad, where some believe Harriet Tubman stayed. And a block away at Cliveden, the mansion owned by former Pennsylvania Chief Justice Benjamin Chew, was the scene of the Battle of Germantown during the Revolution. The Ragsdales' museum "fits the mission of Historic Germantown perfectly," said Tuomi Forrest, that group's executive director. "The museum is lifting up critical stories that need broader exposure."